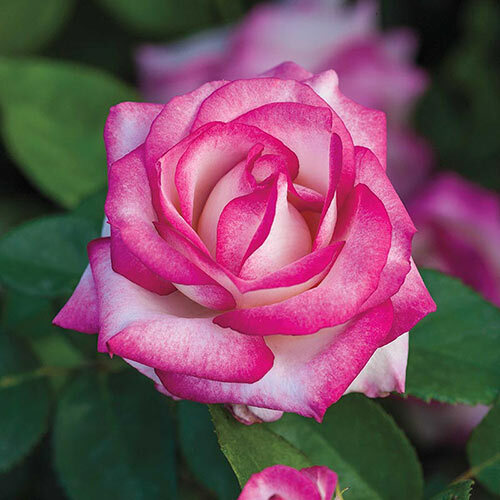 Gorgeous flowers, glossy green foliage and a rounded growth habit makes this rose a winner. Clusters of large, high-centered, pink and white double blooms open in late spring—and continue blooming periodically through fall. Long, sturdy stems make this a favorite for cut-flower arrangements. Miss Congeniality's disease-resistant plants have glossy green foliage that provides excellent coverage. Like other grandiflora roses, Miss Congeniality is a great landscape rose. Grows 36 in. tall with an 18-24 in. spread. Plant in full sun to partial shade. Zones 4-10. FoliageGlossy dark green foliage provides excellent plant coverage. Flower FormPerfectly shaped buds. Clusters of 3 1/2 - 4 inch blooms with strong pink edging. PruningPrune to maintain shape and increase branching once established. Remove any dead or damaged branches. CommentsAbundant bloom production and good disease resistance. DepthSoak the bareroot in water for an hour. Dig a hole about 1 1/2 times as deep and 1 1/2 times as wide as the root system. Mound a small pile of soil in the center of the hole as a support for the rose's root crown. Be sure to keep the graft just above the soil line.